Ribadesella is on the estuary of Sella river. Human settlements were established here from the prehistoric times, some of them leaving wall art figures and other remains, providing copious information about their way of life. Ribadesella remained almost unchronicled in Middle Ages until late fifteenth century, when count Luna purchased Ribadesella to Fernando de Avalos, who got it as a donation of King Juan II. Years later, during the Catholic Monarchs Ribadesella was incorporated to the Crown domains. September 24th 1517 is a landmark in Ribadesella history; King Charles I had landed a few days before in Villaviciosa and payed a visit to the town. 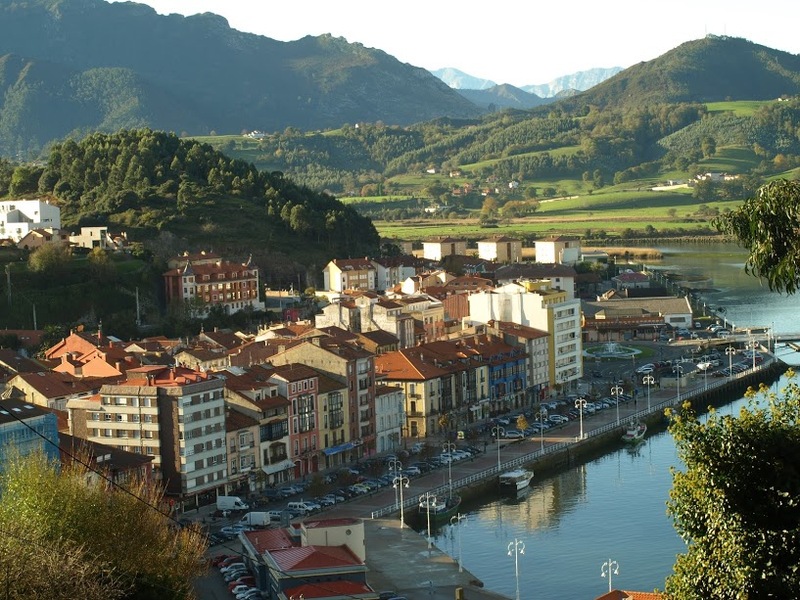 Ribadesella´s names derives from latin ripam, bank, in the last decades the town has become an important centre of tourism in Asturias, but quiet and calms. The level of hotel accomodation has increased considerably. The activities in fishing, agricultura, cattle and tourism of médium/high rate are the most important sources of income. Ribadesela is enclosed between the Somos point and Corbero peak, respectively crowned by a Lighthouse and the Chapel devoted to Virgen de la Guía. The old town guards some remarkable manor houses, seventeenth and eithteenth centuries: The house of Cutre is a notable example of renaissance civil architecture. Also the palace in 15th, Aranda street is a relevant structure; it is the birth house of painter Darío de Regoyos. In the left bank, across the 300 meters bridge, wich serves as the arrival pódium of famous Sella descent, allegedly the longest in Spain in 1890 (date of construction), lies the Santa Marina beach, with plenty of villas and small hotels. In the left bank of estuary lies the Cave of Tito Bustillo. It is considered as the most important archaeologic deposit. Today the Access is via a tunnel, 165 metres long excavated in 1970. Two years before, the cave had been discovered by the speleological society Torreblanca; Celestino Bustillo, an enthusiastic member, died a few days later of the finding. The original entry to the cave stand in Ardines, three kilometres far close to La Cerezal chasm, where the speleologists started the search. Also in the area is the La Loseta cave, its end connecting to Tito Bustillo´s main gallery. The galleries today available to visit forma un underground network, carved by the San Miguel river, today flowing at a lower level than the cave mouth and ending closet o the escavated tunnel for visits. In the Eastern area, right-hand there is ne of the called sanctuaries with some signs paintings in red, it was called the “chamber of vulvae”, because said sins were being identified as feminine vulvas. To the left there is the other sanctuary; it consits if some carved units of animals, many of them decorated with inner shapings in relief. Paintings and carvings, yet more spectacular are found in the western area of the Cave, near the erstwhile entrance and the chasm from where the first investigators got this find. In it outstands the Horses Gallery, because this animal is predominant in the pictures, and the Main Wall, with polychrome figures, the best known ones in the Cave. Figures in this wall belongs to different ages, but not very far away. The most ancient are the red ones, it has been imposible to identify them, and some animals in black. The bichromatic figures, a color for the silhouette and another for refilling, as the ensemble of horses and reindeers belong to a more moderna era. In the lower part of Sella valley, near Tito Bustillo more caves have being unearthed, positively inhabited in prehistoric times: For example the San Antonio on the right bank. The Cuevona, near Ardines has a great natural beauty and with musteriense and magdaleniense vestiges. The La Lloseta, or del Río –named before-. Les Pedroses, in El Carmen with paintings of multiple tracing of oxen, horses and deers. The Cova Rosa, in Sardéu is one of the best solutrense and magdaleniense deposits. In junco, going out of Ribadesella stands there is the romanesque church of Santa María. It formerly was part of a monastery, of which no traces are left. The temple keeps remains as the erstwhile construction: some wall paintings and the coat-of-arms of Ruis de Junco stock. Cole by, in the San Miguel de Ucio parish stands the Palace of Sebreño, built fifteenth century in renaissance style. We follow the coastal highway to San Esteban de Leces. The new parish temple was built atop the remains of a romanesque church; of the erstwhile structure only were let a window in the Apse and some Modillions. Near stands the Tower of Ruí Junco family, built fifteenth century, with some extensions added sixteenth century. A little further, near Torre villaje a right-hand fork leads to Vega beach. Along a rivulet across the Entrepeñas gorge. The Sandy ground of the beach extends up to Berbes, in the caravia county. One of the smaller of Asturias. In prado, the capital stands the González Cutre palace seventeenth century. The rear facade has a Stone tablet, the same one as the used by King Alfonso III the Great in his constructions. The propietors allegedly affirm it is related to the former Santiago monastery. Founded by Munio Roderci in the early years of fifteenth century.